Interior Dimensions: 12.5 x 8.8 x 5.4"
12 x 9.5 x 6.7" tasxudetwc 12 x 11.75 x 6.7" 12.5 x 8.8 x 5.4" 15 x 10.5 x 6.7" 9.5 x 7.8 x 4.9"
A sleek, subtle bag for the photographer on the go, this Retrospective 7 V2.0 Shoulder Bag from Think Tank can carry a combination of camera bodies, lenses, laptops, tablets, and other accessories. The Retrospective 7 V2.0 can hold a standard DSLR, two lenses, a flash, and a 10" tablet or 13" laptop. It has a zippered opening to the main compartment that can be tucked away when not in use, and a hook-and-loop front flap allows for rapid access. A dedicated luggage handle pass through flap on the rear of the bag makes it easy to carry while traveling. The front compartment can hold several accessories and includes a zippered pocket for valuables. Also included is a seam-sealed rain cover that completely encloses the bag in case of inclement weather. Box Dimensions (LxWxH) 29.5 x 15.0 x 11.0"
Retrospective 7 V2.0 Shoulder Bag is rated 4.1 out of 5 by 9. Rated 4 out of 5 by Juanpablo from SIZE MATTERS I recently bought this camera bag, and I am ok with it, but I wished it was bigger or have more room, as for what I am doing now. I usually carry more than one lens, 3 to be exact and this model can hold one camera body with a len an have space for extra one, leaving pretty much no room for more in the main compartment. It has extra pockets and all of that but I think the spare space left is tied. In general, is a good bag, no complains, I like the color, material and I am happy that came with a rain cover, it can hold a 13inch laptop. I just wished it was bigger. Rated 4 out of 5 by Leo from Good bag for walking around in the city Before I buy this bag, I did went through many online video reviews, it fits what I am looking for. I can place my Nikon D850 with 24-70mm f2.8 lens attached. a 70-200mm f 2.8 at the side. still have room for a 85mm f 1.8 lens or a speedlite. That is what I need for walking around in the city with a non-camera bag looking bag for security. I like the top zipped cover gives an extra protection of my equipment won’t be jumped out by accident. A little pricey but can’t find any replacement in the market. Rated 5 out of 5 by Daniel from Great This bag is perfect for travelling, is very well built, i am very satisfied with it, I bought it from B&H because that new model is not available yet in Montréal. Rated 5 out of 5 by Phillip from Convenient and stylish bag! 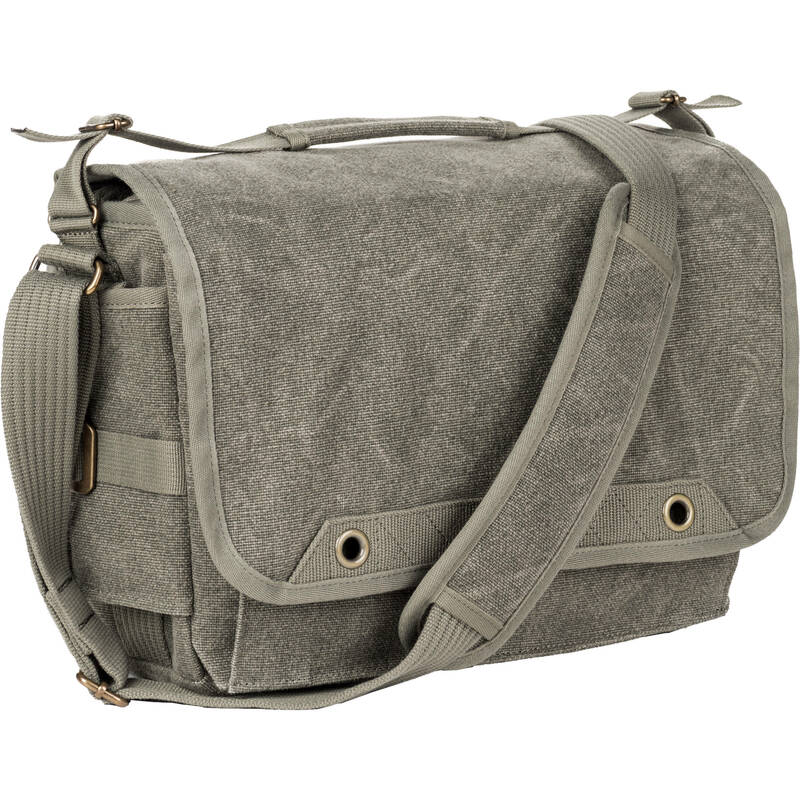 Great bag, easy to pack my camera equipment and Lens in and out. with the Convenient of the 13” laptop. Rated 5 out of 5 by Guilherme from Tick all the boxes! Best bag I’ve owned (and like many of you, I’ve had more camera bags than I can count). Tried quite a few messenger bags before (included latest and expensive PD), was never happy. Settled with Retrospective 7 now and took the opportunity of giving away and/or selling my other bags. I’m just keeping my also awesome Lowepro Pro Tactic backpack for occasions that backpack is more suitable. But most cases the Retrospective 7 is my go-to bag for a combination (not always at the same time) of 5D3 (with RRS L bracket always installed), 24L, 85L f/1.4, 135L, 70-200L f/4 II, 580EX II flash, filter case, TC-80N3 shutter release controller, extra battery, cards, etc. I can even wrap my RRS TFC-14 & BH-30 rig on top of it (although not ideal) with some make-shift straps I did just so I can be hands-free for a while…I highly recommend this bag for the look, quality, design, attention to detail & functionality. Rated 5 out of 5 by Matthew from Pricey but just right for my travelng gear What I carry around when I travel is a Rebel DSLR, a short zoom, a long zoom, a flash, a pouch of accessories, and sometimes a water bottle. So for me, this bag is perfect, with a little room left over. Nice heavy cloth, adequate padding and very thoughtful design in terms of things you can adjust. I must say, for the price, it should be! Rated 2 out of 5 by Pablo from How are the sides not padded? Big fail on this bag from Think Tank. For some reason they decided not to pad the short sides of the bag. It doesnt handle weight well at all; I placed an EOS R with an RF 50mm 1.2 in the center, and the bag just collapsed inwards pushing the two other lenses on the outside slanted inwards. This is just a big mess of a bag. Will this bag hold a 12.9&rdquo; iPad Pro (newer version)? Thx! With the Folio keyboard cover, does fit but barely. Long axis of iPad fits easily but with just a hair too tall in my opinion. My concern with this arrangement is I don't think enough protection to keep it from becoming damaged.